In October. 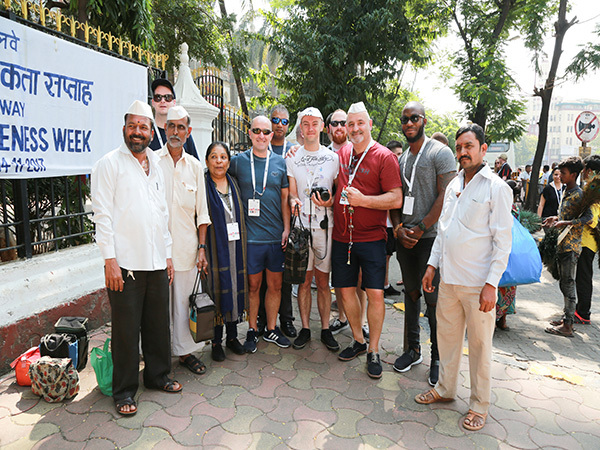 The Head­bangers from the EMC hopped on a plane to travel 4622 miles to India; final destination Pune, to take part in the second annual Global Team Improvement Circle Convention. Joining the adventure were teams from across Jaguar Land Rover, repre­senting Halewood, Solihull and Castle Bromwich, as well as other indirect, non-manufacturing areas. The event also welcomed, for the first time, a team from CJLR, our Changshu sister facility. India is the home country of Jaguar Land Rover’s par­ent company Tata, which has established vehicle manufacturing facilities, as well as a recently opened joint venture Ingenium En­gine Manufacturing Centre, to serve the local market, adding another sister facility planned for Day 3. But first time to sit back, relax and unwind from the journey. The view from the hotel was amazing, including be­ing able to see the historic Gateway to India; an arch monument built during the 20th Century, located on the Waterfront at Apollo Bunder in South Mumbai overlooking the Arabian Sea. The evening meal was an opportunity to meet the Indian hosts and also catch up with the other teams. CSR was on the agenda for Day Two, but first, a visit to the TATA management training centre in Mumbai, to hear more about the history and heritage of the company and its commitment to giving back to its local communities. Within walking distance of the training centre was a Tata-funded orphanage, where the teams were put to work on a number of projects and activities, including painting and decorating and refurbishment. It proved to be a great team building exercise, as teams bonded over a commitment to help those less fortunate. Day Three and the Global TIC Convention dawned, with excitement and a few jitters. On arrival at the Pune facility, the teams got their first glimpse of the Lake House and con­ference area where they would be presenting their ideas. But before, they were able to take a guided tour of the local facility to see how it compared to their own home operations. Luke said: “We were quite nervous, but had to wait right until the very end, to do our presentation. The Convention was split across two rooms, but the other room finished ahead of ours, which meant everyone came into see our presentation. All eyes were on us. It was a great opportunity to see what our colleagues from other countries were working on. With the presentations complete it was time to relax and unwind and enjoy some food and live traditional music at the Lake House... Everyone was able to take in the atmosphere and reflect on what had been an incredible day. The team’s final day was spent taking in the culture of Mum­bai. Accompanied by local guide visits to a traditional Indian market and shrines. It was then time to freshen up ahead of the celebratory last evening meal, with plenty of food, music and dancing. As the curtain falls on TIC 2017, a new wave gains momentum, as TIC 2018 progresses. There’s still time to sign up and be part of a fantastic experience. Click here to visit the internal TIC Page for more pictures and to watch a film from India.